Left to right: A vampire, natch. A ghostly ninja thing with a circle around one eye, natch. A menacing candle, natch. A fisherman. A possibly insane and decidedly girly clown. And a pirate. In the original Puffy Shirt. An ad exec and dashingly handsome father of three, Halloween was once his best outlet for creative expression. I think reader, you will agree, he rocked it. Giggling forth out of our house, empty pillow cases in hand, eyes twinkling and fingers itching for loot... in my house, we follow the tradition of my family of origin. 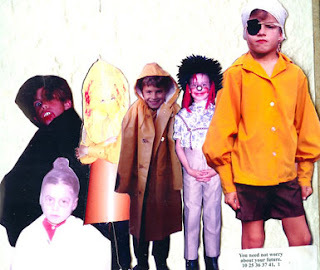 I have had a pirate, a fairy princess, Frankenstein, a hula girl, and Paddington. I sewed mylar, horribly unsuccessfully, for an alien tunic. I had a self-unravelling mummy in tea-died old sheets torn into strips, a dinosaur princess (we were hurricane refugees! I grabbed my son's old dino costume and a tiara before we fled north for water and electricity...), and a high-concept red crab. I wait longer than I should, survey the available odds and ends, and create. From the costume bin in the garage: packed to the brim with Salvation Army finds. (My sister Lisa's best Christmas gift for my Littles, years ago.) I make runs for bits from party stores, from Walmart. Foam core is often involved. Glitter. We have never had a recognizable character. They each asked maybe once - and then it didn't come up again. Likely due to my vehement response. And some years, these decidedly home-made costumes often cost far more than their $15 Walmart alternatives. But mostly, I think, in homage to Mom. A celebration of creativity, of adaptability, of a little magic. It's because I like messing with face paints, too. And I like the fact that we have no idea what this stuff will look like until it's done. The reality was somewhat less cohesive. Mom encouraged us to make our own costumes. She would help, and resources were limited. But what we wanted to be, we could be. She encouraged, she assisted - but she didn't drive the process. And flat-felled seams were not involved. There was the year that Tom was a candle, and Terry a Television Set. Made from a box. With a message on the screen that said something like "Please give to my UNICEF box so that children who have no Halloween can also share in our Good Fortune." (Tree sister, of course.) Whatever Lisa and I were, we paled in comparison. I mean, a candle and a purely altruistic TV set? Over the years, the four of us headed out. We were clowns and gypsies and every animal that could be made with a stocking mask, a leotard, and a tail. One year, I wore a long dress and a "real" tiara borrowed from my friend who was a little pageant star. She reminded me that with my brown hair I wouldn't be convincing (she had blond curls), but I still felt almost pretty for the whole night. There is magic in all of it. And while I know I am making work, inventing hassle, and creating a wee bit of unnecessary strife... we're doing it again this year. There will be a witch of sorts, in a tutu. A cowboy, with eBay boots we're hoping come in time. There will be a zombie, though I have made clear that there will be no visible evidence of brain-snacking. We will all be a little frantic. Maybe more than a little. Tonight I will assemble costumes and make that last Walmart run. And there will be fun. Hard won. The best kind. ...and let Sebastian be a candle. We always had homemade costumes, it would NEVER occur to us to buy something except the face painting kit. Gypsy, Bum,. witch, my brother and his friends going as KISS! I loved Halloween, after we got back, spilling all the candy out ans swapping with siblings. Eating my little sisters once mine was gonr (2-3 days tops.) We never worried about going door to door, everyone did, but we did look for those rascally razors that were never found. *sigh* so much fun. We were seldom satisfied that the vision got captured, once Mom turned over the costuming to us, but it always felt like we had earned the candy. That's what you're up to, missy... still trying to earn the free candy, after all these years. And as a member of your 'family of origin' I wouldn't expect it to turn out any other way. to cat, thanks as always for capturing the sweet memories of our childhood and putting them into words as only you can. you've done my costume lineup proud. to liz, an eight year old knew nothing of such adult things in the 70's. don't sully my sweet and innocent childhood memories with your tawdry insinuations. sometimes a candle is just a candle. surely liz's reference to "something more adult" referred to the old fashioned real-flame candles (as opposed to the currently pervasive childsafe flameless type). which you so very clearly were,tom! why no mention of the elephant of papertowel core trunk and oversized raincoat?